Being that it’s Tuesday, it’s HOT, and… well… just because it sounds the most fun- we are starting with topic #2) Managing the traffic instead of letting the traffic manage us, in highlighting and discussing ideas to be increase the number of games on fields. 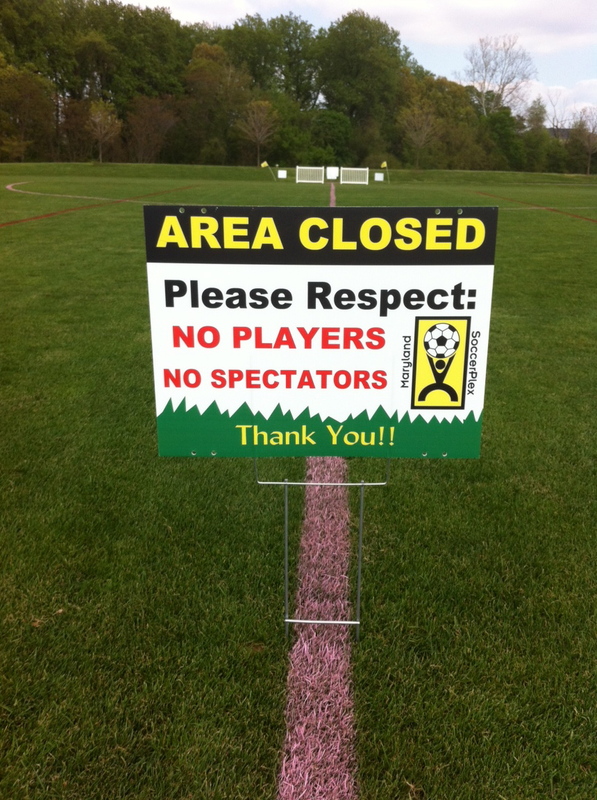 1st- Some will ask.. why would we want to INCREASE the number of games on our fields. Well.. put simply.. that is our JOB! More importantly, increased play serves the needs of our patrons and creates additional revenues for our facilities to operate. Grass fields will take the traffic as long as we as managers are pro-active and creative! 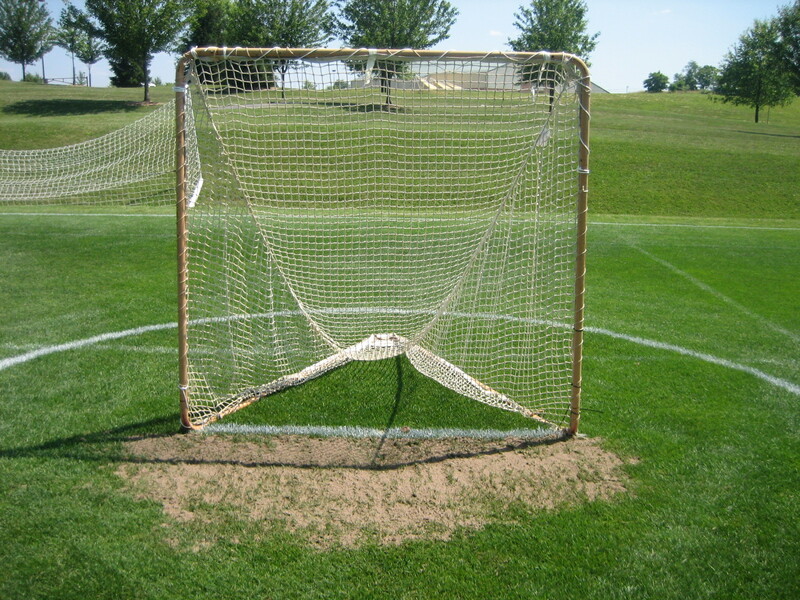 This topic will mostly reference lacrosse, as it is the sport that is the most detrimental to our fields. But lacrosse has 2 major positives when it comes to “managing the traffic”. To start, let’s comparing “managing the traffic” to “managing the field”. 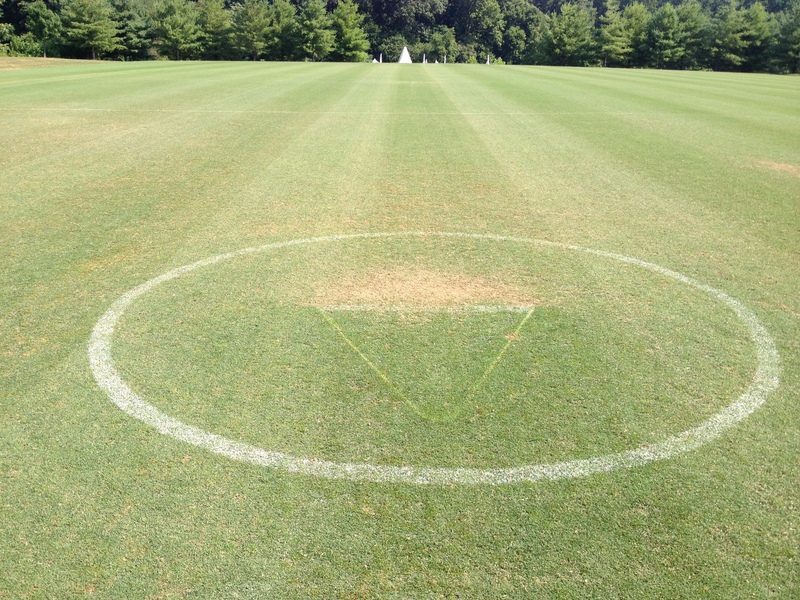 “Managing the traffic”- To maintain the playing surface according to the wear patterns of a certain sport. To move around the traffic wear patterns in order to diminish damage. 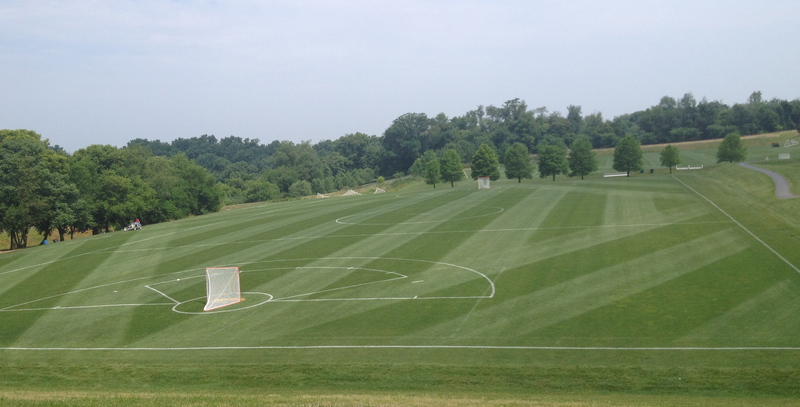 With those differences in mind, and with the understanding that a lacrosse field (as soccer) has minimum sizes and maximum sizes, re-sizing and moving the playing field is the quickest and best way to maximize the number of events on a field during a competition (tournament). 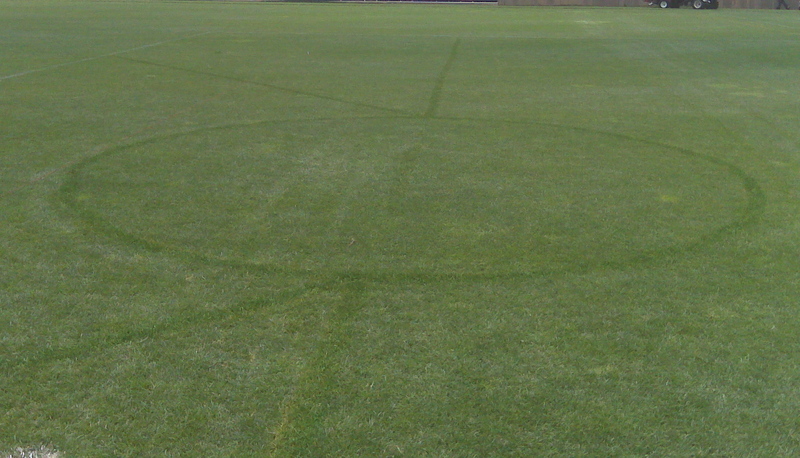 Our soccer fields can play up to 78 yards wide safely. With a lacrosse field sized to 60 yards wide and shifted to a side, there is 18 yards (54 ft) of open space on 1 side of the field platform- and the center of the playing field is 9 yards off the center of the platform. After a certain number of games, the competition field can be shifted to the other side of the platform, moving the center of the traffic 18 yards…. 9 yards off the center to the other side. The move is far enough that almost no traffic is overlapping. The worn areas can be aerated immediately, along with a fertilizer or bio-stimulant spray.. recovery begins immediately, even during play. Certainly this is significant work- measuring out a new field, painting green over the old lines, and painting new lines. But the benefit of additional revenue with less field damage outweighs the amount of work required. 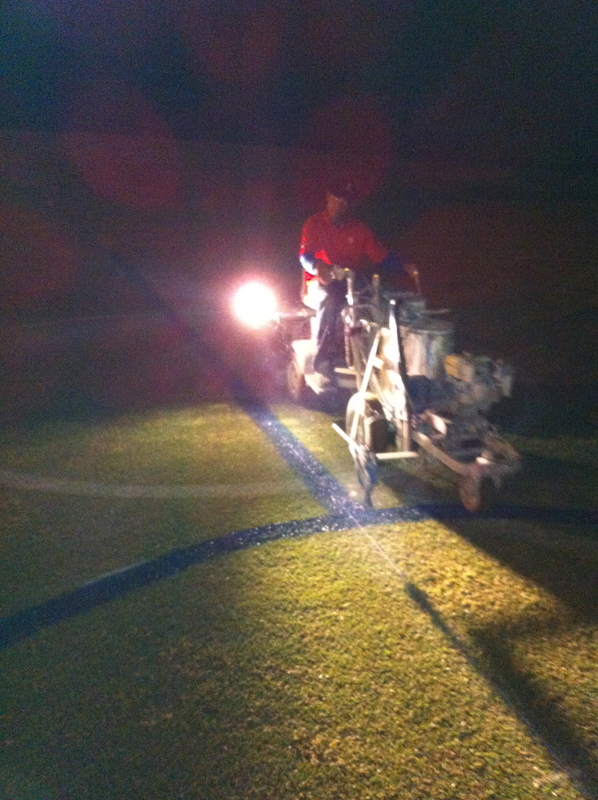 This past weekend, we required construction lights to work most of the night shifting over the most heavily used 10 fields, 2 days into the Club National Championships. 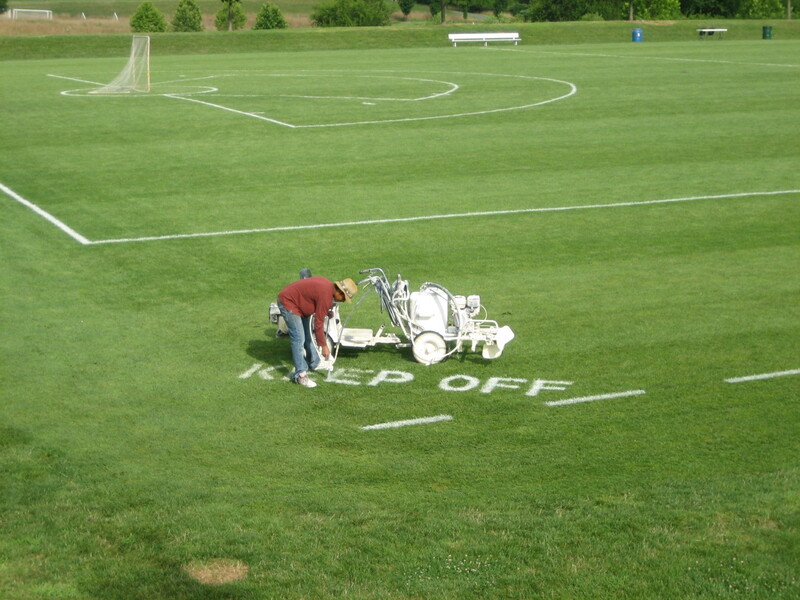 Additionally to combat traffic wear, we bury the goal mouths in sand prior to the start of the competition. Using a Pro-Gator full of sand, a scoop shovel, and a rake- a 2 man crew goes around to all 19 grass fields and hits each goal mouth. The layer of sand provides a layer of protection to the crown of the plant, and acts as a nice topdressing layer once aeration through the worn spot takes place following the event. Protecting the un-used areas of the field is a big challenge as well. The teams arriving for the next game want to use the large area for a warm up area. Using signage, a restriction line, and education with tournament officials and with the patrons- it has become 2nd nature for the tremendous tournament officials that we work with to enforce out rules to protect the area out of play. Kudos to them… it proves that positive education and working pro-actively to empower everyone around us to help keep the fields in perfect condition actually makes a difference! Each tournament/ event, our traffic management techniques evolve. Sometimes we try things and they just don’t work- or they aren’t worth the amount of time that they take. In the end, the more tricks we can find and the more traffic we can sustain… the more revenue that is generated. Now… what kinds of additional ideas click in your mind as we discuss this topic?!? This entry was posted in Maintaining a Strong, Healthy, and Durable Plant Under High Traffic, Sports Fields by GrowingGreenGrass. Bookmark the permalink.